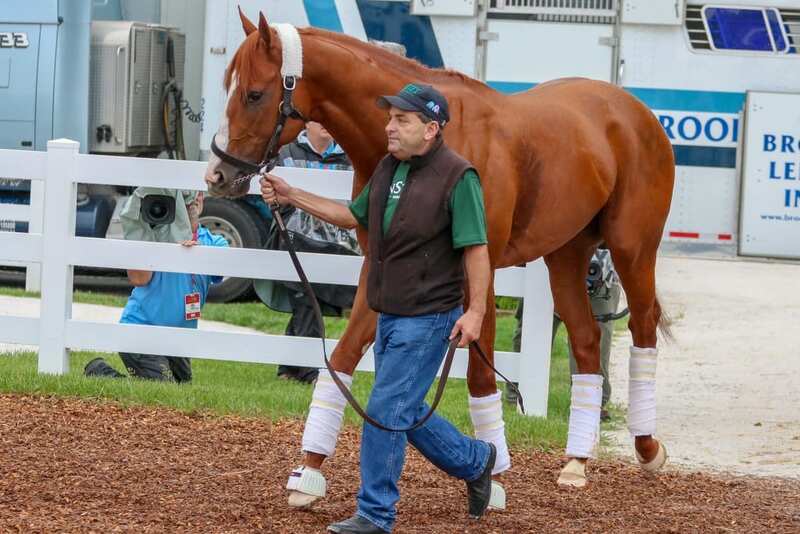 Justify arrives at Pimlico prior to the Preakness. Photo by Dottie Miller. With Hall of Fame trainer Bob Baffert watching intently, Triple Crown hopeful Justify went for his final gallop around Belmont Park on Friday morning, a day before he attempts to become the 13th Triple Crown winner in the Grade 1, $1.5 million Belmont Stakes presented by NYRA Bets. The rangy, chestnut colt galloped 1 3/8 miles around Big Sandy with regular exercise rider Humberto Gomez aboard. Baffert was happy and relieved that all the prep work has been completed, and it’s on to the 1 ½-mile Belmont, where he will be seeking to become only the second trainer to win more than one Triple Crown, having won his first in 2015 with American Pharoah. “We got the last gallop in, just another smooth, good day,” said Baffert, who watched the gallop through binoculars with his wife Jill at his side, along with several members of the four ownership groups: China Horse Club, WinStar Farm, Starlight Racing and Head of Plains Partners LLC. A TV helicopter also arrived to film an aerial view of Justify’s gallop, and Baffert was glad he chose to equip Justify with earplugs. “I’m glad we did because when I saw that helicopter up there hovering over, I guess they wanted to watch him go around there,” said Baffert. “He is just moving over the track really well. It’s just amazing how he switched leads right on cue, comes down the lane. This is what a trainer hopes to see the day before his horse runs. Justify won the Grade 1 Kentucky Derby and the Grade 1 Preakness, both over sloppy tracks, to set the stage for his Triple Crown try against nine rivals in front of an expected crowd of 90,000. The weather forecast is calling for partly cloudy skies with a 20 percent chance of rain. Nothing so far has seemed to bother Justify, bidding to join Seattle Slew as the only horses to win the Triple Crown with an undefeated record. “We just wait. It’s a long day. You’re thinking about everything,” said Baffert. “He’ll be nice and calm. We keep it really quiet.